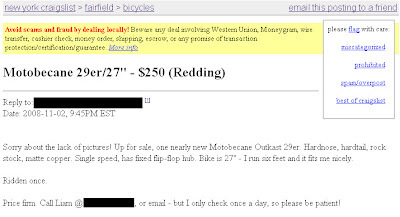 I always find it funny to see a brand new bike immediately being sold on Craigslist after just one ride. I would think that if you wanted try the Koolaid, one ride won't make you a believer. Of course, there could be other circumstances, like Liam is getting deployed to Iraq. Not sure if that is the same guy but it could be. Below is the image of this bike from Bikesdirect.com. Click on it and it will take you to the website where this bike is offered. It's definitely priced competitively but it has quite a few limitations for example, there is no rear hanger so if you wanted to go geary you would need an after market solution and there are no disc brake mounts. I am also curious about the size. The add says 27" and but I think the seller really meant to say 17." That would be a little small for someone who is 6 feet tall. Then again, it could be the seller, being 6 feet tall bought a bike too small and want's something different. You would think, however, that he would try to discount the bike less than almost 40%. My only other concern would be the ride. This is an aluminum bike and the ride is going to be really harsh. I know from personal experience by riding my Fetish Fixation rigid offroad. Still, at that price, or if you could get it for a little less than the asking price it would be a low cost koolaid taste test. If it wasn't for you and this indeed came from Bikesdirect.com, then it ships with a flipflop hub, so you could get some nice 700x40 or 45c cross tires and ride this as a fixie! In fact, if you look at the specs what you will see that the front chain ring is a 42T? 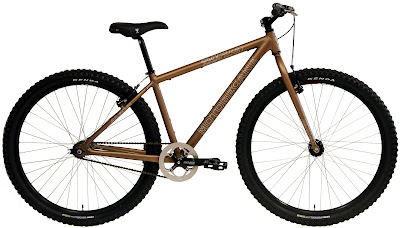 This configuration is not for mountain biking unless all you are going to use it for is carriage roads and rail trails. No, Motobecan missed the boat on this bike entirely. Yeah, you could ride it off road but unless you have 22T as the back cog you are going to pushing this bike up most hills. I don't think this is the guy deploying to Iraq, either because he has another bike posted on CList for what I think is bit extravagant.